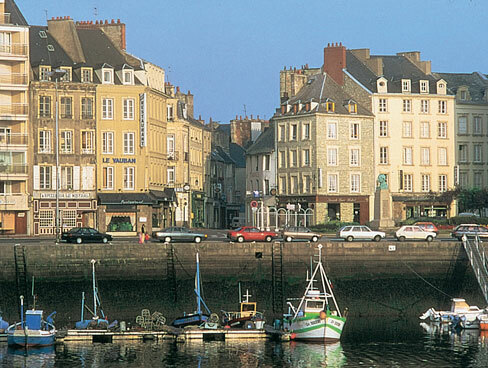 Make the most of a short break to France by sticking close to the port towns. Step off the ferry and into your holiday instead of spending precious time travelling. Time your ferry crossings to give you maximum time on French soil, fast-craft or overnight crossings can help you get the most out of the time you have available. You might find that you can even do without bringing your car, reducing travel costs and leaving you free to explore. Public transport in France is more than adequate for getting about, or why not bring your bike instead? Choose a B&B or short-let self-catering accommodation; there’s plenty of flexible rentals available, especially outside the main summer season. A few days in France doesn’t have to mean Paris, the coastal towns of northern France have so much to offer from delicious food and great shopping to cultural events and historical sites – pick your port and have a mini French escape! 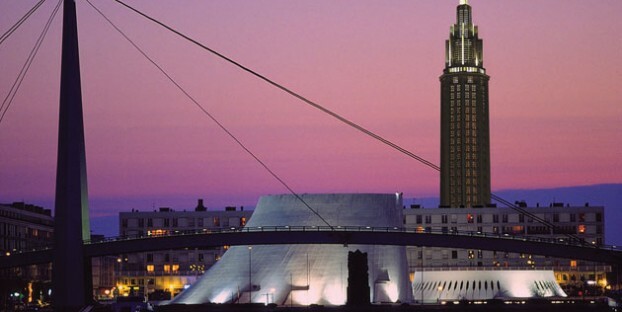 Le Havre was founded in 1517 on the banks of the river Seine where it joins the Channel around 200km from Paris. Le Havre was extensively bombed during WW2 and little of the original architecture of the town remains. Cathedral Notre-Dame is one of the only surviving buildings, dating from the 16th century, and the scars of the war mark its walls. It’s well worth a visit to see the ancient bell tower and beautiful stained glass windows. In stark contrast you should also see the steel and concrete edifice that is Eglise St-Joseph. Built as a memorial after WW2 the church has a 107m high tower that looks like a lighthouse from the sea. Go inside to see the beautiful effects of light through the coloured glass. Le Havre is also home to Le Musee des Beaux Arts Malraux that houses the best collection of Impressionist paintings in France in an impressively modern waterfront gallery. It’s a destination for art-lovers from all over Europe. On fine days you can enjoy the sandy beaches or explore ‘Les Jardins Suspendus’, a walled garden in the ruin of an old fort with spectacular views over the city and the sea. Wander in the quaint streets of nearby Honfleur, a picturesque 16th century fishing harbour with plenty of restaurants and cafes. The local seafood is fresh and delicious and crepes are a speciality of the region. The market ‘Les Halles’ in Le Havre is a great place to stock up with local seafood, cheese, cider and patisserie. 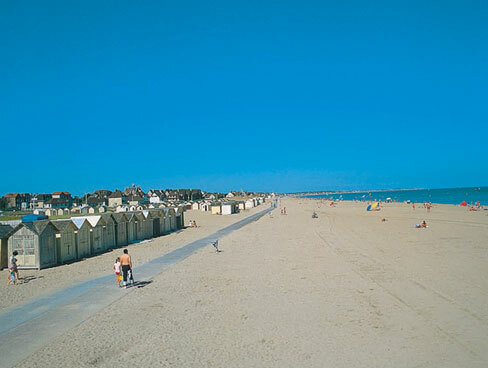 Caen is only 15km from the site of the D-Day landings and Bayeux so if you are interested in visiting the historic beaches or seeing the famous Bayeux tapestry, this is the port for you. Like Le Havre, Caen was bombed extensively during the war, and although a few churches remain about four-fifths of the city was rebuilt in the 1950s and 60s. There is a famous WW2 memorial museum in the city. One historical site not to be missed is Chateau Ducal de Caen. Built by William the Conqueror in the 11th century it is one of the largest medieval castles in Europe. A walk along the ramparts gives you an excellent view of the city and it’s the perfect place to explore and take a picnic. The grounds are free to enter but there is an entrance fee for the museum. Explore the narrow streets lined with shops and cafes, discover the many gardens and parks and stroll along the marina in the heart of the city. There are so many restaurants to choose from with something to suit every taste and budget, from simple baguettes and crepes to Michelin starred dining. The delicious local cheeses, cider and calvados make ideal souvenirs. 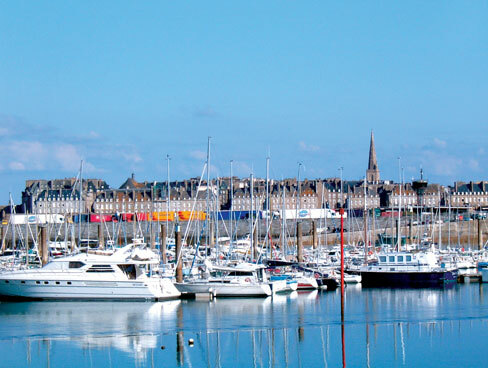 At the tip of the Cotentin Peninsula, Cherbourg is the largest artificial harbour in the world. The port has a glamorous history as a gateway to New York for the cruise ships of the 1930s and even hosted the Titanic on her maiden voyage. Today the harbour area is used for military, commercial, fishing, tourism and leisure craft. The old harbour station is now home to a fascinating scientific theme park ‘Le Cite de la Mer’ that includes a tour of the impressive submarine ‘Le Redoutable’. Cherbourg is famous for the local cider and there are a couple of distilleries in the city that offer tours of production facilities, insight into the history of the industry and samples for tasting. Visit the Liberation Museum inside the hilltop Fort du Roule and enjoy a panoramic view of the city and its harbour. Marvel at the palatial yachts at the marina and stop at one of the many marina restaurants for a traditional Normandy moules mariniere. The grand markets at Place de Gaulle in the old town are a feast for all the senses, full of fresh local produce and flowers. For a more modern shopping experience try the sophisticated purpose-built shopping centre Les Eleis. 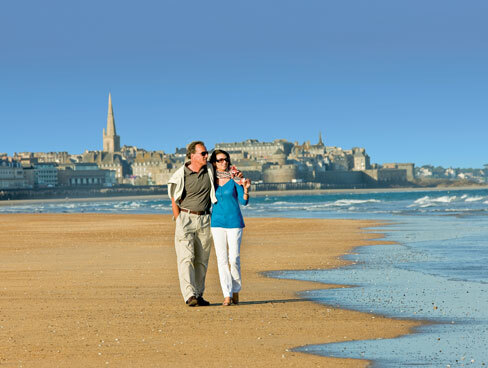 St Malo is a beautiful natural harbour on the Brittany coast. The beaches here are some of the best in the region and the city itself is steeped in history with a maze of medieval streets, a Gothic cathedral and ‘Intra-Muros’ the ancient walled town at its centre. Today the streets are vibrant with life, full of chic boutiques, colourful shops selling local art, cafes, creperies, markets and restaurants. Local specialities include cider, oysters and galettes, local savoury pancakes made with buckwheat and filled with all kinds of delicious cheeses, meats or fish. The Cathedrale de St Malo dominates the city and the view out over the harbour from the ramparts is not to be missed. It’s the best place to view the islands and forts out in the bay. At low tide you can walk out from Bon-Secours beach to visit the pretty islands of Grand Be and Petit Be with its 17th century fort. The Grand Plage is a safe sandy beach near the centre of town, which offers sand yachting and windsurfing for adventurous travellers, and boat trips around the bay for a more relaxing excursion. Mont-St-Michel, one of France’s most famous tourist destinations, is only a short trip away so it’s worth planning in a visit to see this landmark island. 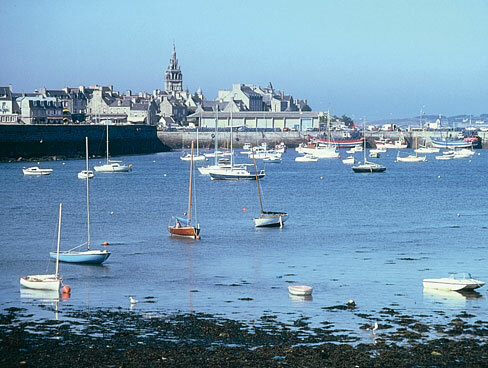 On the north Brittany coast, Roscoff is a pretty fishing port offering a proper taste of rural Breton life. Unsurprisingly the town specialises in seafood with the local fishing boats keeping restaurants and market stalls well stocked. Galettes and crepes and a rich buttery cake called Kouign-amann are just some of the other delicious treats you’ll find here. As well as cafes and restaurants there are plenty of gift shops and art galleries selling local artisan crafts and paintings that make wonderful, unusual presents or souvenirs. Visit the museum dedicated to the ‘Onion Johnnies’, traders who sold onions from their bicycles to people in the UK in the 1920s, and see the beautiful gothic church Notre Dame de Croatz Batz that dates from the 16th century. Ile de Batz is a small island just outside the harbour that can be reached by a 15-minute boat trip. The island is most famous for its botanical gardens but the beautiful walks, unspoilt beaches, stunning views and interesting lighthouse are all worth discovering. The village on the island has a shop where you can buy picnic supplies and it is also possible to hire bicycles to better explore this hidden gem. Roscoff is one of the centres for thalassotherapy in Brittany. The unique therapy uses sea minerals and sea water from the region to offer rejuvenating, relaxing and healing treatments – a luxurious experience you won’t forget! Browse our holiday homes and B&B accommodation to find your perfect short break destination. It might cost less than you think to take a long weekend or mid-week break in France so why not treat yourself?